Fun for any sports fan! Sand bags weigh 1 oz. 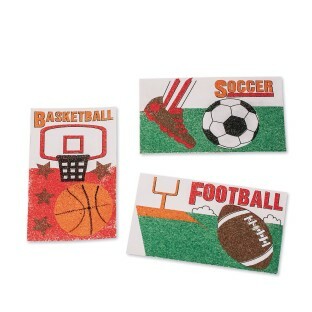 Eight each of 5"W x 3"H football, basketball and soccer sand art boards, plus 1-oz. bags of sand in red, orange, black, brown and green. Note that these are 3x 5 not 5x 7 like all the other sand art kits. The peel off areas are very challenging for kids to peel off.